Can you believe it is already 2017? Where did December and 2016 go? I’m sad 2016 is over but excited 2017 is here. Ever get those conflicted feelings? I didn’t accomplish near as many things in 2016 as I wanted, but if I take a step back and observe from the “outside”, I really did okay. I persevered through lots of changes and came out stronger on the other side. That’s all that matters, right? 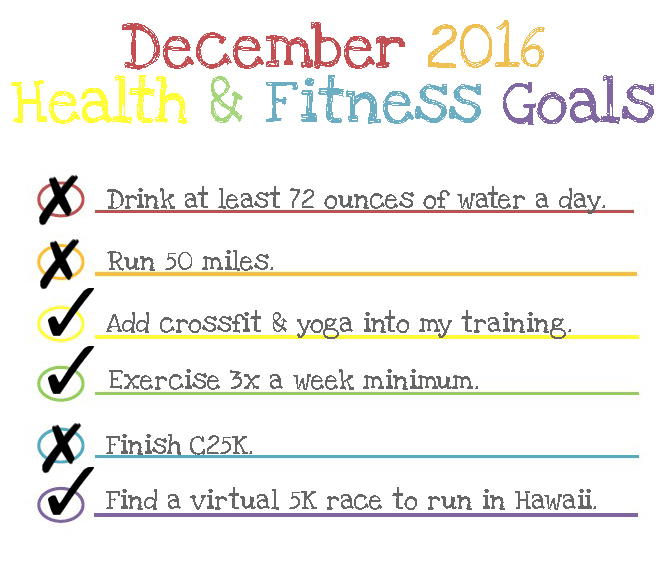 In 2016, I lost 40+ pounds, ran 5 races in 3 states and stepped WAAAAY out of my comfort zone and dipped my feet in the crossfit waters. 2016 was good, but 2017 is going to be even better! 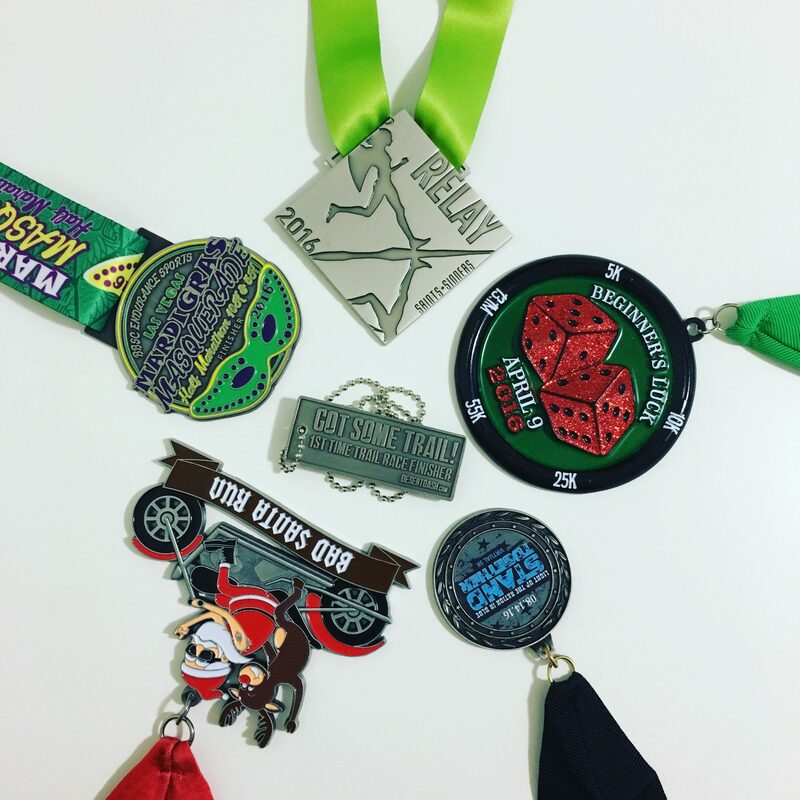 In order to hit the race goals, I have 5 races so far on the schedule, all paid for and hotels booked for the travel races (except Vegas). 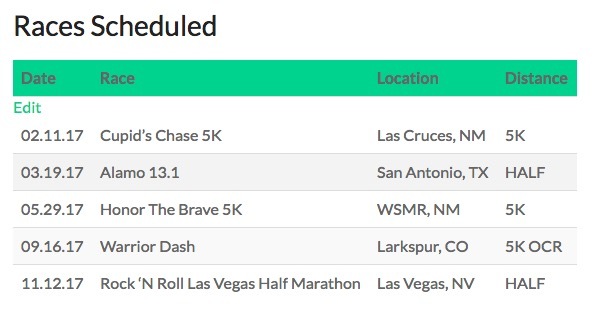 I may pick up a couple more local races, but that will all depend on schedule and cost. I have deemed this area race hell and travel races get REALLY expensive, fast. I am most excited about the R’nR Vegas and the Warrior Dash. Vegas is my nemesis race. The first race I ever DNR’ed (thank you cancer). I ate a TON of money with that race and plan to KILL it this year. It will also be my first solo weekend away since 2012 and I need a break. Too bad it is still 10 months away. Warrior Dash is a mini getaway with Bryan and our first OCR. It scares me because my upper body is not very strong. Yet. 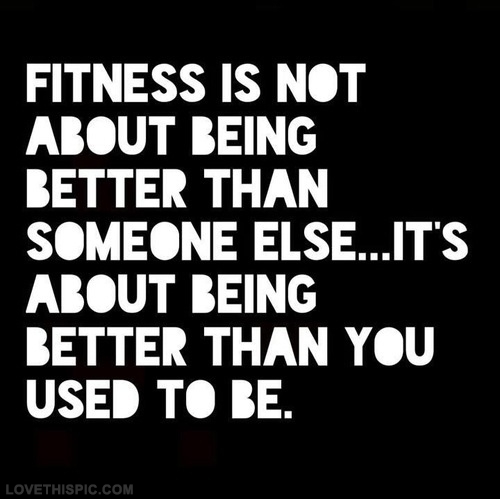 That is what crossfit is for this year. Okay, so how did I do in December, specifically. Eh, mixed bag. I set big goals, knowing vacation might derail them and that is okay. I hit my water goal, 25 out of 31 days. 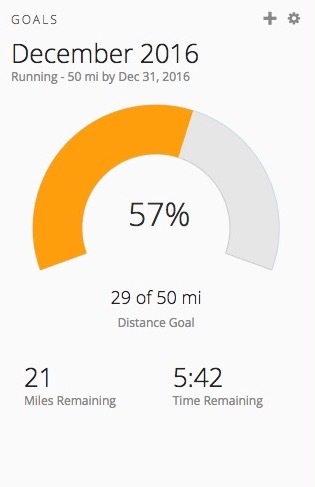 Run 50 miles. Fail. Bahahaha. Add crossfit and yoga. Check. Exercise 3x a week. Double check. Finish C25K. 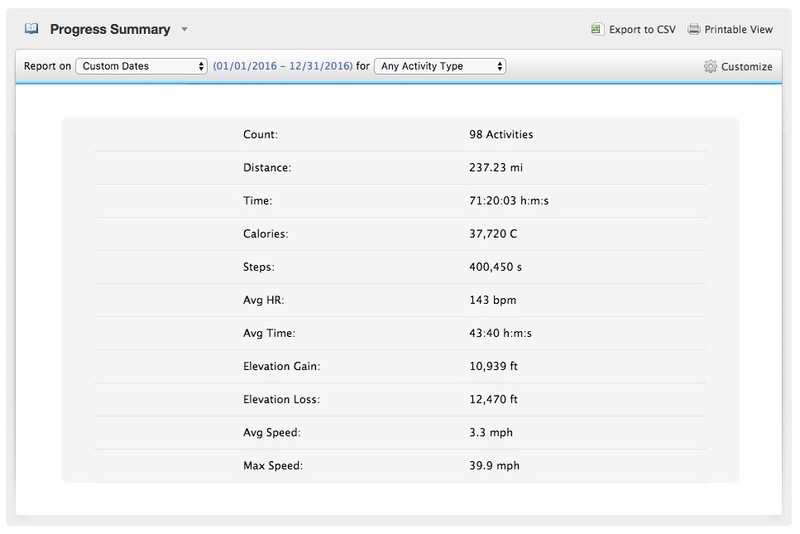 I ended December minus the last 3 workouts. But I can run for 30 minutes straight again, so I still win. Registered and completed a 5K in Hawaii. One more state crossed off my bucket list. All in all, December was a success in my eyes. 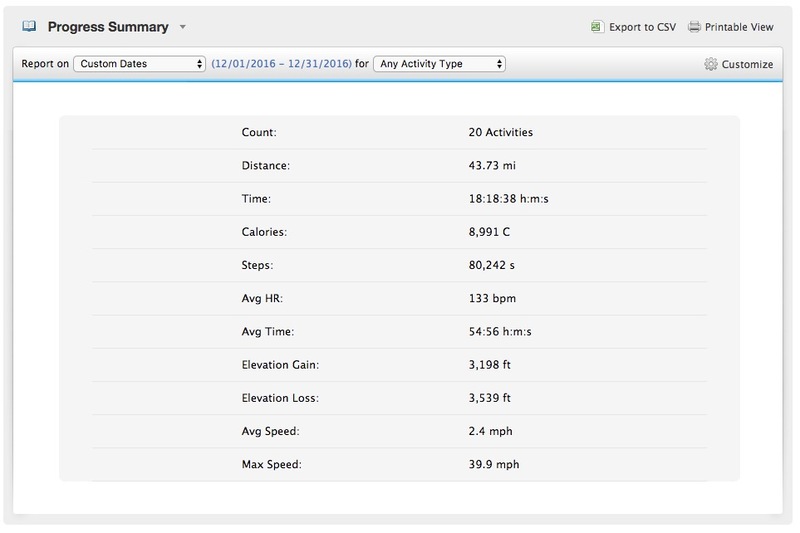 I’m still chasing that 50 mile goal and now that half training has commenced, I should have no problem making it. 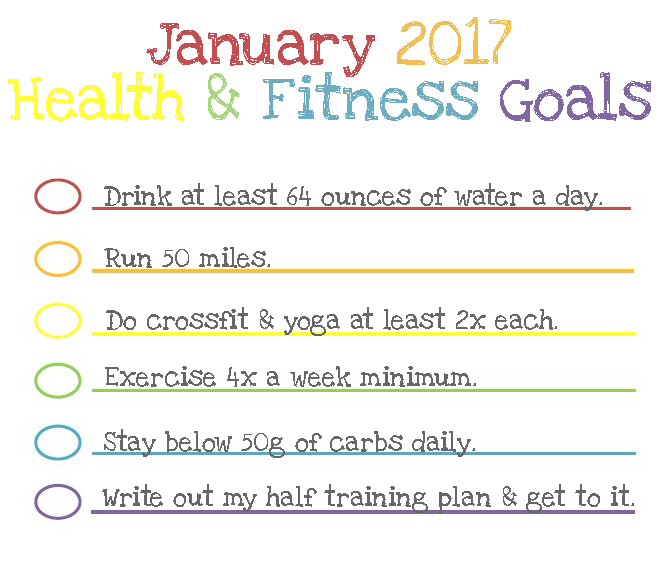 Did you set any goals for this month or 2017 as a whole?